The true heart of the Czech state and the most sacred place for all Czechs is situated in the middle of the main Third Courtyard. In earlier times, the Rotunda of St. Vitus founded by St. Wenceslas in 925, was located here on the present day site of St. Vitus Cathedral. 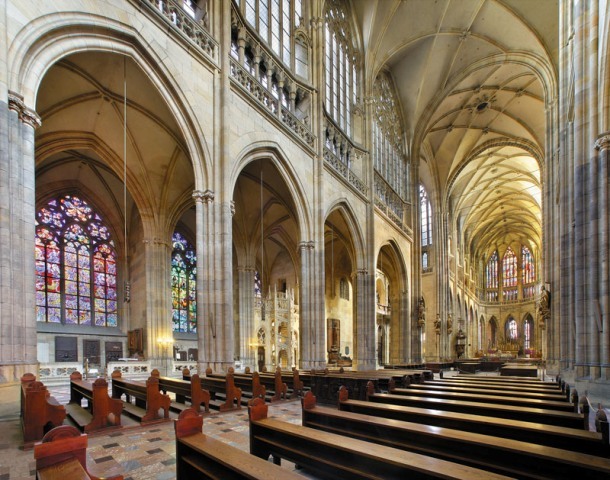 In the 11th century, the Chapel of St. Wenceslas succeeded the Romanesque Basilica that once stood here. 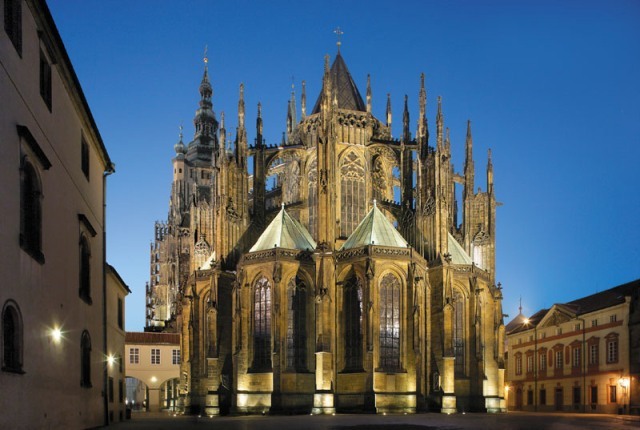 It served as a Cathedral to the Prague Archbishops, as well as a coronation and burial place for Bohemian rulers. The body of St. Wenceslas, eternal king and protector of Bohemia reposes in the Chapel of St. Wenceslas and the Crown Jewels are deposited above the chapel in the Coronation Chamber. 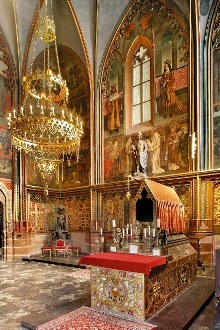 St. Wenceslas Chapel, built under Charles IV by Petr Parléř (1367) demonstrates the significance of this place. Its square ground plan actually disrupts the usual scheme of a cathedral ground plan of the day, because it was not possible to relocate the holy grave of the main patron of the country. It was the wish of Charles IV to demonstrate this. 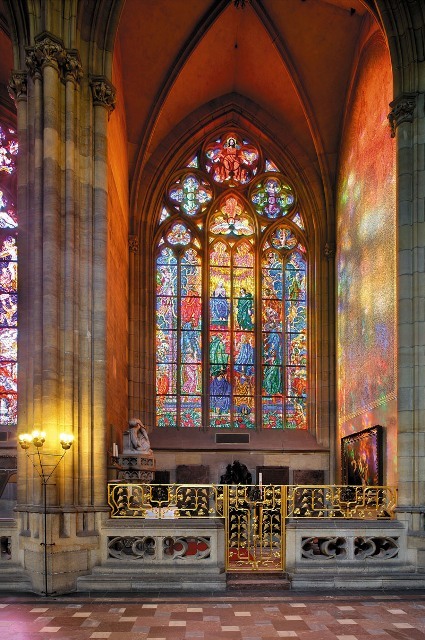 Covered with bright semi-precious stones and frescoes, the walls of St. Wenceslas Chapel dating from the 16th century recount the legend of St. Wenceslas. The two-metre stone Statue of St. Wenceslas (1373) and frescoes depicting the Passion and the portraits of Charles IV and his fourth wife, Eliška Pomořanská date from the time of Charles IV. The completely exceptional star vault of the chapel also dates to the reign of Charles IV. The other fittings are Renaissance, except for the Neo-Gothic gilded chandelier and the altar tombstone of St. Wenceslas dating from 1913. 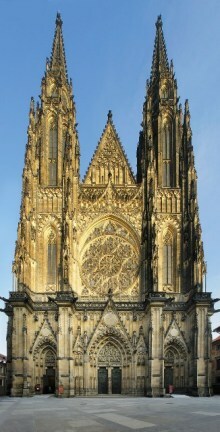 The Golden Gate forms the monumental entrance to the cathedral between the Great Southern Tower and the St. Wenceslas Chapel. Its vaulted entrance hall was constructed in an unbelievably complicated manner by using “free rib technique”, where free space is lined with structural buttresses. Although it is a work of the 1360s, it anticipated practices which were in use about one hundred years later. 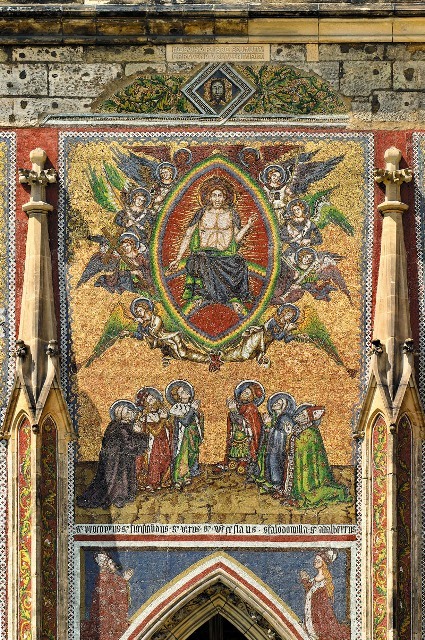 The outer frontal wall of the Golden Gate is decorated with a mosaic from the time of Charles IV on which he is portrayed with his fourth wife, Eliška Pomořanská. Venetian mosaic makers made it in 1371 according to designs by Czech painters. It is the biggest and oldest outdoor mosaic north of the Alps. 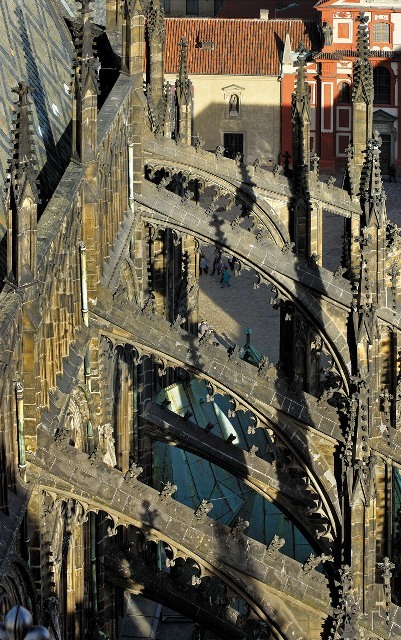 Petr Parléř’s workshop not only made the Chapel of St. Wenceslas and the Golden Gate with the South Tower, but also the presbytery of the cathedral up to the Old Sacristy, roofed with a bold vault with a suspended apex stone. Built in 1356, this was a technically superlative performance in its day. The Vault of the Presbytery built in 1385 by Petr Parléř, is one of the oldest net vaults in Europe. Late Gothic architectural designs produced during construction of the Prague cathedral were replicated almost a century later throughout central Europe. The busts of the lower triforium are rare not only in regards to their realistic design, but in their subject matter. Members of noble houses and the highest church dignitaries in the kingdom are depicted as well as both of the cathedral architects (Matyáš of Arras and Petr Parléř) and five building directors. 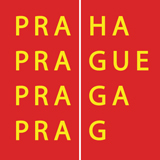 Paying tribute to the artists themselves was quite unusual in the Middle Ages and demonstrates the pre- Renaissance character of the Prague Court of Charles IV. 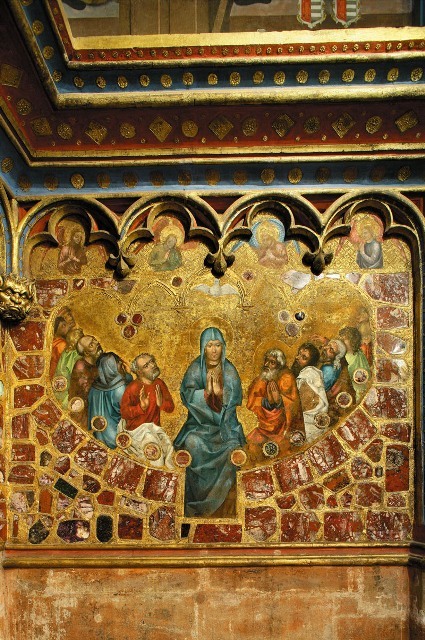 Some of the original painted decorations have also been preserved in the individual chapels of the presbytery – Gothic wall paintings from the end of the 14th century. 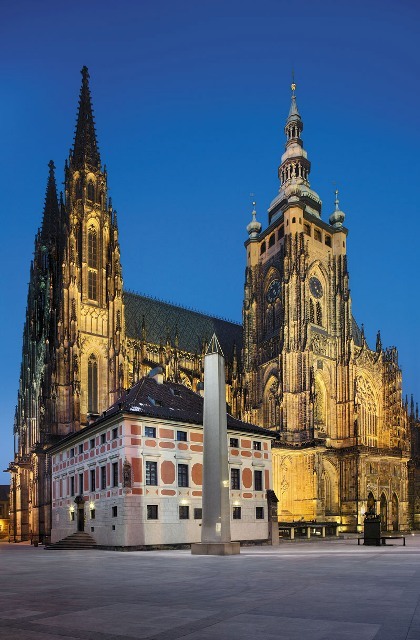 The remains of older buildings have been preserved under the cathedral, where you’ll find the eastern Crypts of St. Cosmas and Damion from the 11th century, the southern masonry and northern apses of the St. Vitus Rotunda, as well as tombs for the Kings of Bohemia and their wives. The Royal Crypt was built at the end of the 16th century into the remains of the Romanesque buildings of the St. Vitus Chapter House. Its present-day appearance is the result of renovations made in the early 20th century. Pride of place belongs to Charles IV († 1378), but his son Wenceslas IV († 1419) is also buried here with his spouse Johanna of Bavaria as well as Kings Ladislav Pohrobek († 1457), George of Poděbrady († 1471) and Rudolph II. († 1612), who is stored in his original, richly decorated tin coffin. After the death of Petr Parléř in 1399, building work slowed down, and after the outbreak of the Hussite Wars in 1420, it stopped completely. 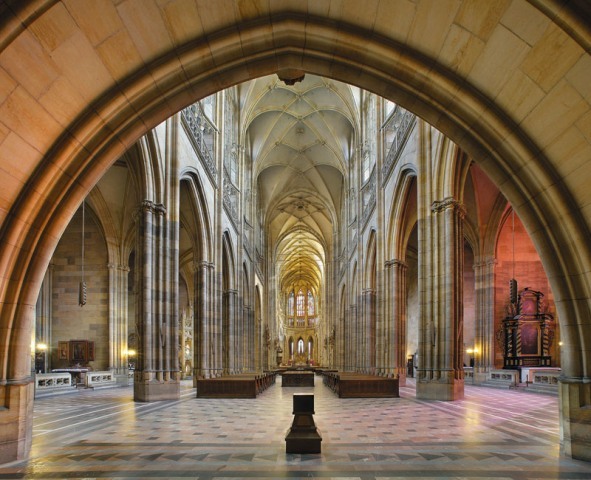 Over the following centuries, only the cathedral was completed. The Late Gothic Royal Oratory was built in 1493 in tribute to the Jagiellonians. The Renaissance-styled Royal Mausoleum with the graves of Ferdinand I, Anna and Maxmilian II was built in the late 16th century during the reign of Habsburg dynasty. The silver tombstone of Jan of Nepomuk that decorates the Baroque cathedral was completed with allegorical statues and angels in 1746. Work on the completion of the cathedral continued well into the 20th century. The decoration of the cathedral became an opportunity for modern Czech artists to show their abilities. Josef Václav Myslbek’s Tomb of Cardinal B. Schwarzenberk, completed in 1895, was granted an award in Paris in 1900. Regarding modern works, the original Art Nouveau symbolic altars by the sculptor František Bílek, or the stained glass window displays by famous Czech artists (i.a. Alfons Mucha, Max Švabinský) are certainly captivating.